Paddy Coughlan and Ned Kelly’s new pub is changing name – for one day. 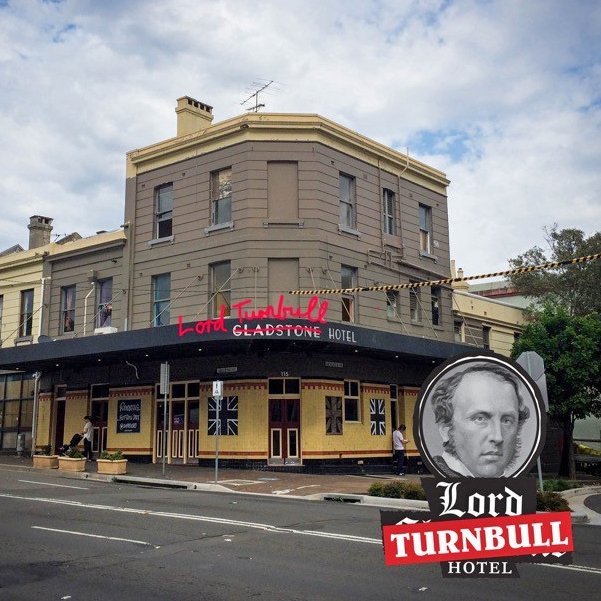 Having announced the acquisition in recent weeks, in a new venture with old partner Rodney ‘Ned’ Kelly, Paddy’s Lord Gladstone Hotel will be re-named the Lord Turnbull for one day only – in support of the ‘Abbottsolutely Hopeless’ campaign. A 4.5-metre high vinyl billboard poster created by artist Michael Agzarian was erected across from the Chippendale hotel a month ago, and Friday night it will be auctioned off at the pub to raise funds to take the ground-swell ‘Hopeless’ movement interstate. Speaking to PubTIC, Coughlan said the motivation behind the auction and name-swap comes from the Government’s ignoring the will of the public, as displayed in focal areas such as Chippendale with the overwhelming support of Agzarian’s “Hopeless” campaign. “I’m no fan of Abbott, but mostly I just can’t believe that Malcolm Turnbull is the most popular in country, and only thing stopping him from being Prime Minister is his own party. Keying in to the bohemian inner-Sydney suburb, Coughlan admits the hotel is “a dive bar” both in its Facebook categorisation and reality, reporting the place “looks like a bomb site”. “It was a rough pub to start with, but every day we work on it, then clean up and from 4pm Wednesday to Sunday are open for trading. Coughlan and Kelly’s new venture – We Are Bourke St – is based on plans for “innovative projects underpinned by sound fundamentals and strategic thinking” and the Lord Gladstone is the first property in a plan for a series of acquisitions in the coming year. The auction of the Abbott “Hopeless” poster will take place at the Lord Gladstone Turnbull on Friday night at 6:30 pm.